SAVE up to 94% when you call global on iPhone, Android, BlackBerry and Nokia. Haven’t got a smart phone? Don’t worry Vopium works on over 900 different mobile phones. 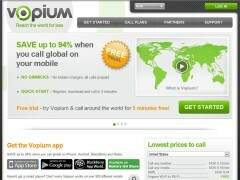 Vopium works on both old school mobile phones and smartphones – 900+ mobile phone models. Vopium Pro – Just dial or tap a contact. If you optionally use Vopium, Vopium will connect you invisibly to a near by local access number and via internet, onward to your calling destination. You pay your mobile service provider for a local call and Vopium for the international part of the call. Vopium Out – When your mobile is connected online via Wi-Fi or 3G, Vopium keeps your call online almost the entire way until it gets to the country of your destination’s mobile or landline. You pay no call charges except Vopium’s international call rate. Vopium Free – When you and the person you are calling are both on Vopium and Wi-Fi, its totally free! We recommend that when you are out travelling to use Vopium via a Wi-Fi connection. If you make an international call with Vopium from a country other than your homeland, Vopium will route your call to a local access number in the country you are visiting. Because of this, you may end up paying your mobile service provider an international roaming charge. Therefore, we recommend once again, always use Vopium from a Wi-Fi connection when out travelling to eliminate any roaming charges.